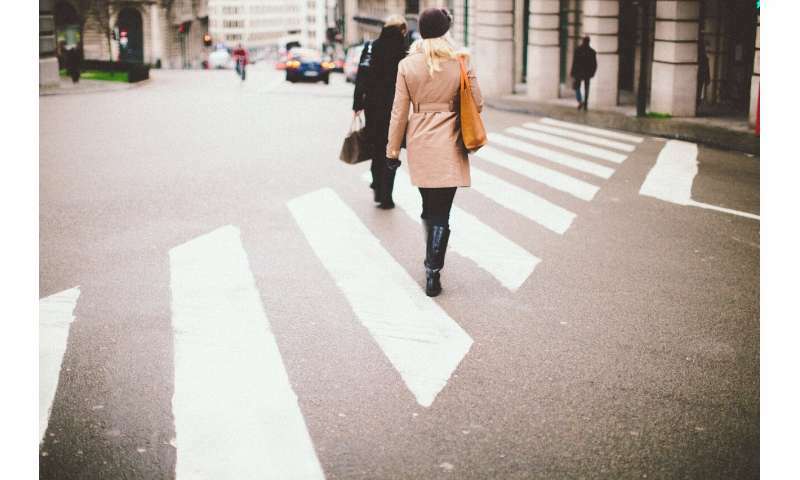 A team of researchers at the University of Tokyo has found that large numbers of pedestrians meeting in crosswalks tend to follow the Lévy walk process. In their paper published in Journal of the Royal Society Interface, the group outlines their work observing crowd movement and what they found. When large groups of people stand on either side of a road waiting for the light to change and then find themselves walking toward one another, they tend to walk in predictable ways. The approach taken is not generally one that typically provides the most direct or the quickest route, but one that takes into account the other people around them. In this new effort, the researchers sought to learn more about the behavior of people in such situations by studying them very closely in action. To learn more about how people behave in crosswalk-type situations, the researchers enlisted the assistance of volunteers and asked them to walk in what they describe as mock corridors. As the volunteers did so, the researchers filmed them in action. They noted directional changes, the number of steps taken and step patterns. The researchers found that individuals tended to deviate from their expected straight-ahead path as a means of most efficiently reaching their destination, and in so doing, faced a trade-off between path length and speed of transit. They noted that each individual made adjustments to their path based on the actions of those traveling in the same and opposite directions. They also found that collective action tended to arise, though the individuals involved did not seek to become participants. The collective action typically involved the formation of streams of people walking in uniform ways in both directions. Thus, rather than people continually meeting face to face, walkers would simply follow a person moving in the same direction, preventing the constant need to shift their path. Doing so increased efficiency both for the individuals and for the crowd as a whole. The researchers also found that streams created by walking individuals followed the Lévy walk process. The Lévy walk process is a mathematical description of a type of walk in which the pedestrian takes small steps, but then takes long steps at regular intervals. Mathematician Paul Lévy showed that it leads to a power-law distribution of step lengths. Good God, how ignorant and out of touch with reality can researchers be? People generally walk using the same protocol as driving i.e. keeping right . I don't know if this is true in Great Brittan where they drive on the left instead of the right. This seems so trivial. Trolling for aggressive crosswalk strategy stories maybe. I mean people scoot along until they hit a crosswalk with a red light, then they shuffle around until the light is green for them, but the article says nothing about those times, just crossing with the light. Anyway, reminds me of the fuzzy math finding, not too hard to check. After reading similar equations off legal size fax paper for a decade or so you might start to notice the smallest details are less critical to some people than to others. I enjoyed reading this, actually. Thanks for that. Amused at robots I imagined jostling for position in the middle of a street at every crossing. If it had been written by Bob N. Weave that would have been even better. How about pedestrians who cross somewhere near or in the middle of the block which in the US is called 'jaywalking' and who sometimes get ticketed by an alert cop. In the UK the pedestrian has the right-of-way when crossing a busy street when the light turns green, even as a car is turning the corner.